I love this rug, I have bought them in many sizes. I have read other reviews where shoppers complain about the smell. It is a natural fiber & has a natural odor when you first get it. This odor disapates quickly. You would never know. The texture of the rug adds so much character to the room. The varied neutral colors of the fibers makes it possible to blend into any decor. This rug is amazing. Ordered a very large 9'x12" rug for a very large space in my living room. I read all the reviews and despite a few negatives I decided to go for it. 'Ve ordered many items from OS in the past and have never been disappointed. First off, I need to say that My rug arrived and it was owe some. t is much thicker, hardier yet softer then Zi expected. I love it even more then when I ordered it now that I have it here. next, I did not get a "dirty" or smelly rug as several mentioned. yes, it had a slight earthy smell to it upon opening it from the packing but it quickly dissipated.. I will take a slight earthy, albeit temporary aroma of a natural carpet any day over the ever lasting smell and toxic fumes of a synthetic carpet. Also, I did not have the shedding many people mentioned on here. Perhaps I am just accustomed to natural items in my place but regardless, I do not have "fuzz" on my clothing from the rug nor to my cats get covered in rug fuzz. I have to wear solid black to work every day and this carpet is not an issue whatsoever. Also, this rug, although not as soft as traditional wool or synthetic pile rugs, is very comfortable on bare feet. It is nubby but it's as though the jute was seriously beaten to soften the fibers. It's nice. Mine came with rich, subtle Hugh's of browns, beige, gold and just a hint of reds. the reds are not as prominent as shown in the picture yet they are there. My furniture is all neutral as is my decor but there is enough contrast in color and texture in this rug that it adds warmth to the room. I love this rug. The price for the size and quality can't be beat. if you are looking for a refined look, this rug is not for you. f you are looking for a natural, warm, enviting look, this is it! Great jute rug! Dark rich color, thick in weave and holds up well. Adds softness and nautical vibes to any decor scheme. Very neutral and versatile from a decorator's perspective. Would highly recommend! Have purchased this rug twice for two different projects. Almost Perfect - So Close!!! Like the others have said, this rug does have that "wet twine" smell when you unroll it however that was gone in 3-4 days. No big deal at all. We have had the rug for several weeks and did not encounter the "rug debris" that others have mentioned. I vacuumed it really well before I put the furniture back and have not had a problem. The rug is in a very high-traffic room and we have two large, long-haired dogs. One dog is black and the other is black-white-tan so we are lucky enough to have hair of every color in our home. This rug replaced a wool rug we had for about 6 years and I had to vacuum at least every other day. Last week I went five days (OK - we were really busy!) before vacuuming and you couldn't even see the dog hair - OMG - this is truly amazing!!!!! The color of the rug is gorgeous - kind of a muted mix of all natural wood tones with a bit of gray thrown in for good measure. The color is much richer in person than in the picture. We have found that this rug makes our room look so much larger than the dark wool rug we used to have. The rug is not perfectly square - it does have a bit of a hand-made edge to it. It is very thick and chunky as described. The only reason I gave this rug four stars instead of five is the fact that I have stepped on, and subsequently removed, two twigs that were woven into the rug. I get that the rug is woven from all natural jute materials however I did not expect to step on a couple of sharp twigs. Hopefully that is the end of those little devils. All in all, we are thrilled with our rug and going to order a runner to match. I really wavered on buying this rug. The reviews are all over the place. After receiving this beautiful rug I think the disparity in reviews is due to #1 people who've never owned a jute rug before (e.g., they are "messy" in that every few months you have to roll them up and vacuum the dirt that falls through the weave and residue that naturally comes off the rug over time). And #2, it's possible since this is a natural fiber rug that each rug varies in quality a little. I can say without reservation though that I love my rug. It is the softest jute I've ever seen or felt and the style is exactly what I was looking for to go in our den on our tile floor. I don't know how well it will hold up as I've only had it a week, but if it holds up well, this is a rug I'll enjoy for years and at an amazing price. The color is true to the photos and when our young dog is being playful and running across it, it will shift a little (slightly bunch up in places). A pad beneath would probably help with this. I don't mind though. It straightens out quickly and easily. This is the first large rug I've purchased as I recently removed all the carpet throughout my home and installed LVP. I was looking for a rug to soften the room while creating a coastal vibe. I'd read many reviews on this rug as well as other rugs and purchased this one for 3 main reasons: price, material and color. I purchased a 9 x 12 for my 16 X 17 den. 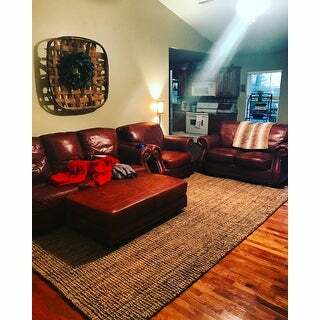 I wanted to stay under $ and the price for this sized NATURAL rug was great, compared to others. The material is as stated and I wanted organic material as I am also going green in my home. It does not bother me that I have to roll up the rug once a week or so to sweep/vacuum beneath it. Yes there's an odor when the rug is unwrapped after delivery but it airs out over a few days and is gone. Being able to remove the debris tracked in by me and the dogs is much better than it settling permanently into carpeting. Within the first week however, the "pile" was unraveling in places where my dogs play. I suppose their nails cause this. I push the fibers back down but the same spots keep popping back up. I would also highly recommend a rug pad to keep the rug in place if you have dogs. The color is as pictured which is OK, although I did expect it to be a little darker, based on some of the reviews. Overall, I'm mostly pleased with this purchase but also minimally disappointed that it unravels and easily moves under pet traffic. This rug looks fantastic! Love the rich color and soft texture. No smell like some natural fiber rugs do at first. I have had this rug for 3 days now and it is already falling apart. Pretty soft for a jute rug but not good quality. If was not so big and heavy I would return. I couldn't be happier with this purchase. This rug has a lot of loft so if very soft underfoot compared to most sials and jutes. I shopped long and hard for the right rug for our living room and am so glad I went with this rug and not the cotton bordered sisals I was leaning to. It's a beautiful, rich looking rug and is very comfortable for a natural fiber rug. There is a smell after just unwrapping and laying it down but I suspect that will go away. It adds a lot of personality to the space. Very happy! My Jute rug arrived today and I have to say, I'm very impressed! I was so nervous before it arrived after reading some of the negative reviews but I'm glad I decided to purchase anyways. This rug is very heavy and very thick and it does have an organic grass smell because it's Jute but I kind of like the smell. Its not over powering. This is a well made rug and I'm glad I purchased. This rug is fabulous! It would have cost be 3 times as much if i bought it from a competitor. I love it! Bad puppy but a great rug! I labored over finding a rug to replace my old flat sisal, and I am so glad that I settled on this one. I have two large dogs and one of them (a 9 month old Labradoodle) chewed on the rug less than 15 minutes after I put it on the floor. She pulled a big hunk of rope out - if you can picture a sweater snagging and starting to unravel, it was that on a much larger scale. I was able to weave the piece back into the rug about 5 minutes and I can hardly even tell where she did the damage! Don't let the name "fine sisal rug" fool you - this is a very chunky, earthy kind of rug. It seems more like jute than sisal to me, but I'm no expert. It is much softer on my feet than I imagined it would be and it actually feels good to walk barefoot on it. The best part is that, from a style perspective, it will go with a wide variety of decorating styles, and the mottled coloration will hide many stains. If you like the photo, go for it (and don't forget a no-slip rug pad). I have bought many items from Overstock and depend heavily on the reviews, knowing to throw out the over the top and the overly critical and weight the rest carefully. THIS rug was a most tentative purchase because I knew how expensive return shipping would be if I didn't like it. I also consider $ to be a nice chuck of change so I wouldn't keep if if I didn't like it. Well........ I love this rug. It's not harsh on the feet (feels like a foot massage) and the weave is thick with a very chunky texture. Although the weave isn't tight, it's not so loose that I worry about it falling apart or the furniture legs going through it to the floor. Upon unwrapping it, the rug does have a very earthy, dirt smell but I imagine that will dissipate quickly after it's been out for a while. 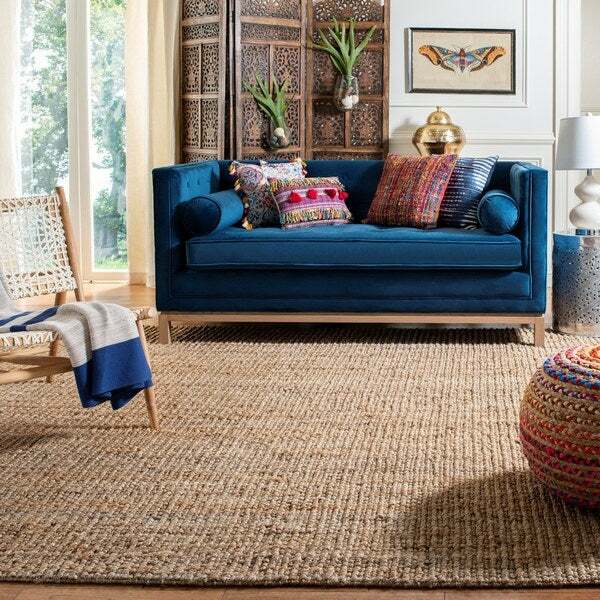 This rug has a rich look to it and is comparable to rugs in PB or RH - I've window-shopped those places for rugs and this one was less than 1/2 of their price. This rug will add a nice dimension to my room.. very happy and satisfied. If my opinion changes after using the product for a bit or it wears poorly, I'll update this review. Worked great. Very nice smell. Some minor fraying already and we’ve only been using it for a couple of months. It looks great and my husband loves the way it feels underneath his feet! Very well made jute rug. It's quite thick and heavy so I didn't need a rug pad under it. We have it on a screened in porch and it looks great! Layered with a cowhide rug, looks awesome! Well constructed. This is well made and is exactly as described. The quality of this rustic rug looks great and grouses the room. It is a keeper! High quality, beautiful rug. It really pulled my room together! Excellent price for the high quality! "What is the pile height? My back door has to clear." The pile height is approximately .5 inches. "How soft is the rug? I have a small child and we will be on the floor playing. Thank you"
"Can this rug be used on both sides ?" This rug is not finished on both sides. It is the same on both sides but the 9 foot edges have a folded over hem. It would not be very noticeable though. "Is this rug pet friendly? We have it and 5 minute after putting it down our dog walked across it and pulled up a giant snag? If post a pic if I could. Very disappointing." We have two dogs and don’t have any problems at all. There must have been a sting that was already pulled that he got snagged on. You can push those stings through so they don’t stick up. Pet claws may pull the fibers of this rug. Please contact Overstock Customer service. "What is the shipping weight for the 9 x 12 rug?" The shipping weight is 86 pounds. "I have a couple of pulls or snags in the rug. Can I cut them without causing damage to the rug?" I had a few snags and pulls in my rug. I just stick them back in place, but they pop out later. Since it is a natural hand woven rug, I just let these incidences be a part of the natural appearance and structure of he rug which is not smooth. It is a beautiful rug. so I will just put the pieces that pop out back in place. I am a single homeowner with no children, spouse, or pets, so it is not heavily trafficked. Hope you enjoy it! I wouldn't cut them out, that could cause permanent unrepairable damage. Try pulling the snag through to the underside, like one would for a snag on a large weave sweater or afghan. You can bend a large paperclip into a hook, feed it through from the back side and hook the snag and pull it through. Give that a try, you might be successful and surprised. At least you won't damage it further. "What is the size of the rug in it's shipping package?How many cubit feet ?" The shipping box is H: 11 W: 11 L: 108.